Want to shake up the status quo in your Supers20 game? Your players will never forget the time that you smashed the entire North American continent and left it for them to pick the pieces. The Sixth Seal is a serialized adventure path for Supers20 - in which the United States is devastated by a massive nation wide earthquake. The PCs must deal with the crisis - and with the chaos and anarchy that it unleashes. As civilization crumbles in the aftermath of the quake - the PCs hold the line against the criminals, gangsters and supervillains who are fighting for power amid the wreckage. 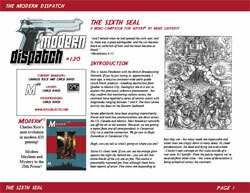 Sixth Seal was inspired by the mind-blowing Cataclysm and No-Man's Land events that ran through DC Comics Batman family of books in the late 90s. Sixth Seal is an adventure path consisting of 4 complete Supers20 adventures with over a dozen fully stated out NPCs ready for your use in your campaign.